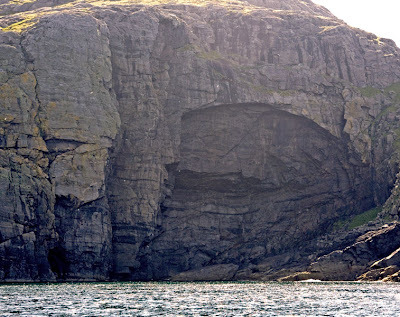 Last week we headed to Pabbay, an uninhabited island in The Outer Hebrides. 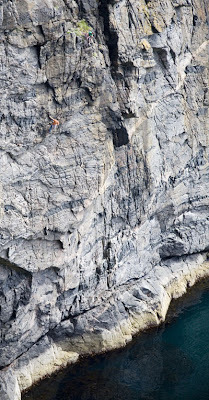 The filming objective this time was to capture some true 'adventure' first ascents on the huge sea-cliffs. The small island measures about 2 miles across and was once home to over 100 hardy Scots. Now it is uninhabited and ownership has passed to the NTS, National Trust of Scotland. It is quite a strange place to spend a week. Visitors to the island are few. In fact the NTS restricts numbers to only 12 at any one time, and the visitors all tend to be climbers. 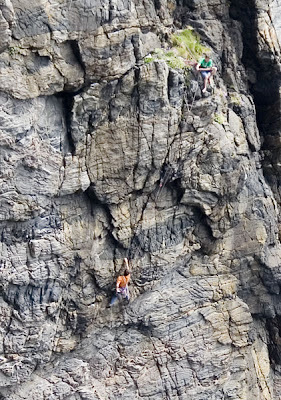 The first route on the island was put up in the mid 90's by some German climbers who were on a yachting holiday and spotted one of the big cliffs. Thereafter development began to increase and The Great Arch even featured in the BBC series The Edge, with Lynn Hill and Dave Cuthbertson paired together to climb one of the most stunning lines in the country. 'To Be Continued' E7 7a - as the name suggests, is still awaiting completion. The ethic in this part of Scotland is for routes to be climbed 'ground up' and on sight. 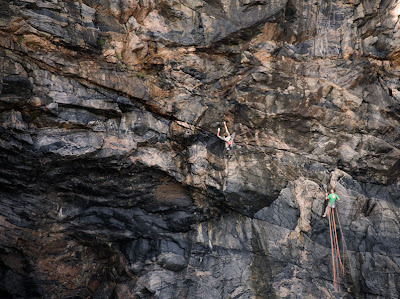 This means no top-rope practicing, it also means no inspection of the line on abseil or cleaning away of loose rock. We embarked on the 15 hour journey on Saturday with a strong group of Scottish based climbers. A drive to Oban and then 3 boat rides finally deposited us on the shore. With no phone reception and with no VHF radio, some dubious looking flares were the only chance of attracting attention if anything went wrong. ...The climbers were breezing up the routes. Niall McNair put up a new E5 without even breaking sweat. Dan McManus made the second ascent (onsight) of one of Niall's own E7s (Geomancer) and made it look easy. Fantastic stuff? except that it wasn't E7 after all. Niall himself seconded it after Dan and agreed, just E6 6b. Elsewhere the other climbers were also having a great time on the sun-kissed walls. This was definately very very bad. Diff and I had a crisis meeting. The movie we are making 'Committed' has 20+ cutting edge routes, hard ascents where climbers are pushing themselves to the limit. But here on Pabbay the footage we were getting would be more suited for a tourist video. Climbers cruising up routes unfortunatly makes for rather dull viewing. Then on the fourth afternoon it finally happened. One of Niall's major objectives for the week was on. He had spotted a possible line up a huge unclimbed cliff. On previous visits to the island this cliff was always wet, but by this afternoon it now looked dry. 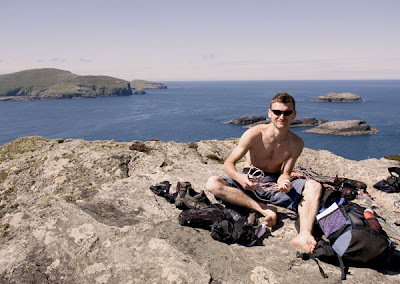 Niall McNair on Pabbay. Mingulay in the background. 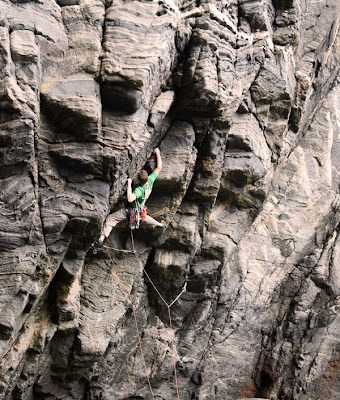 Teaming up with Dan McManus, Niall started up the overhangs on the first pitch. After some strenuous bridging to place gear he rocked over leftwards on crimps, fighting like mad. This was it. With no chance of reversing those moves the only option was upwards. With every metre gained the consequence of failure increased. These are the moments in climbing that we both fear and relish. Past the point of total commitment it becomes a battle of mind and body, experience countering fear, instinct and creativity solving the intricate puzzles ahead. The ticking clock of muscles tiring prompt both decision and agression. Onwards, each move across ancient rock untouched before by human hand. Those of you that know Niall will be aware of his distinctive climbing style. Reminiscent of Johnny Dawes he has tremendous ability to adopt different shapes with his body, feeling his way through moves with great creativity. At last he finished the pitch, ecstatic about the climbing and quality. Huge Wall. 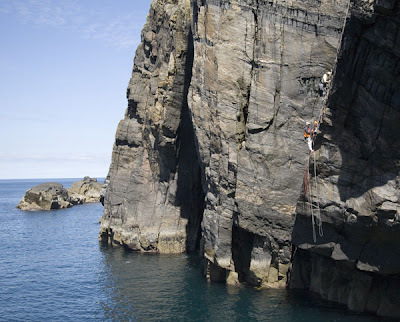 l-r, Tony Stone onsighting and E4, Diff on abseil filming, Dan McManus on pitch 2 and Niall McNair belaying. ...After trying a few different ways to cross the rockband, eventually the second belay was reached. 5 pieces of gear at the belay, all rubbish. As Niall arrived to swap over the lead rack a warning not to weight any of the gear. Pitch 3 was even worse. 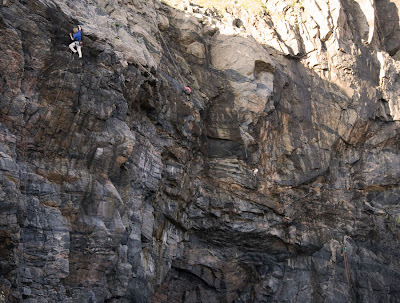 Niall removed loose rock from every hold, blocks flying down past the head of a very worried looking Dan. 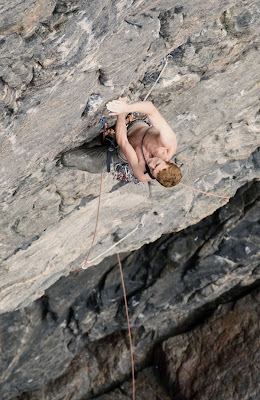 Now with his faith completely shattered, expecting every piece of rock he touched to just break away, Niall gibbered his way through more hard moves before at last reaching easier and more solid ground. A 'Mick Fowler-esque' adventure. Topping out at 10.00pm. Fortunately at mid-summer it's light until 11.30 in these parts. The result. Redemption Ark, E6 6b XS. Those not familiar with that grading scale suffix, the 'XS' stands for 'extremely severe', or maybe it should be 'extremely stupid'. The first pitch was quite brilliant. Finding the line and climbing it clean, on sight is extremely impressive. There after - not to be recommended. Those damn Bonxies (Great Skuas), is that how you spell it? 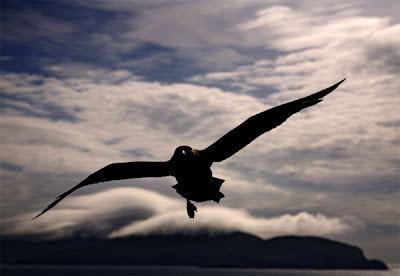 Anyway they do like to dive-bomb you.